I made my inserts using the accordion fold technique. The first panel has my journal-ling on it and each additional panel has a picture. I used my MS Daisy Dot border punch along one edge when attaching a new color to my insert -- you can see it clearer in the photo below. These inserts have journal-ling and picture on both the front and the back -- two are 5 panels long, one is 4 panels long and the other one 3 panels. 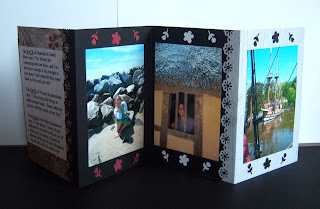 Hope you've enjoyed viewing this envelope mini album --- so much fun to make! cool! minis can get totally addictive alright.